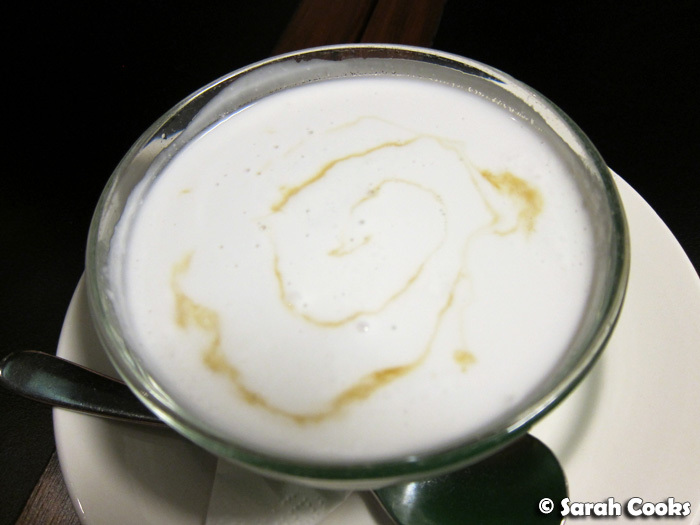 Earlier this month, Clement, manager of Monk and Me invited me to try out their new specials, and of course I accepted! Full disclosure: as you may have read in my previous post about Monk and Me, Clement is a friend of my brother, who worked there many years ago. However, I really like the food and often visit as a paying customer. (Sandra, in particular, is obsessed - obsessed, I tell you! - with their super crispy, amazing curry puffs). We started off with some entrees: curry puffs (of course), and a new item, Jade's Trio. These were juicy little steamed prawn dumplings, with a dipping sauce of soy, chilli and vinegar. 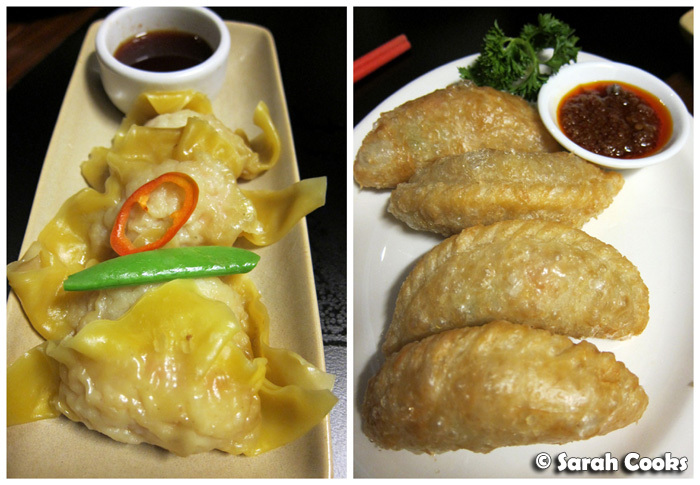 Jade’s Trio – steamed prawn dumplings - $9.00 for a serve of 3. Curry Puffs – $6.00 for a serve of 2. For our mains, we shared the three specials, with two serves of coconut rice - a good amount for four people. Beef Kelantan - Tender gravy beef cubes in an aromatic spicy sauce with coconut shavings. $22. 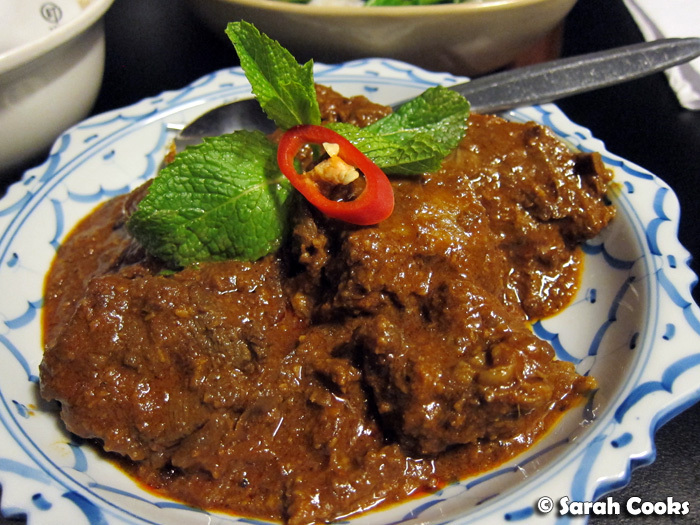 The Beef Kelantan looked similar to a rendang, but was quite different. With less gravy than a traditional curry, this dish was full of large, tender chunks of beef held together with a deeply flavoured, almost smoky sauce. 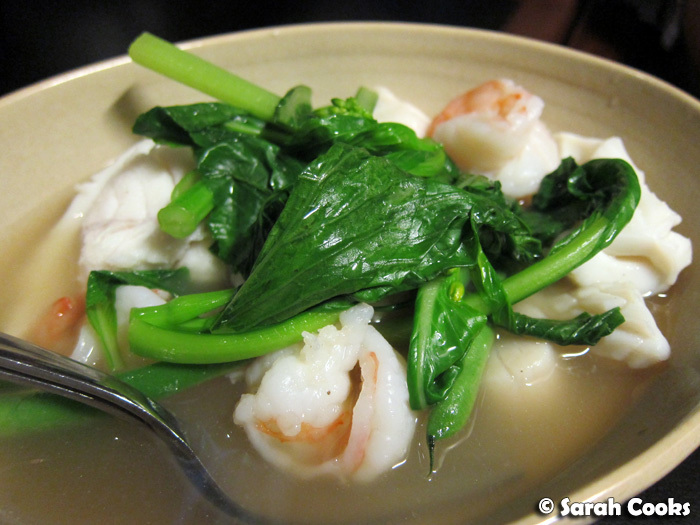 Hoi-sin Quartet - Steamed scallops, rockling fillets, calamari and king prawns served in a fish soup with onion, lemongrass, ginger, celery, pepper, dry chilli topped with steamed choy sum and green beans. $26. 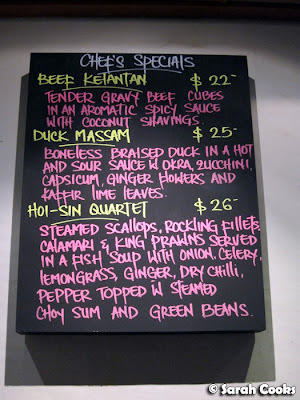 Malaysian food can tend to be a little oily, and the light, clean tastes of the Hoi-sin Quartet were a welcome contrast. 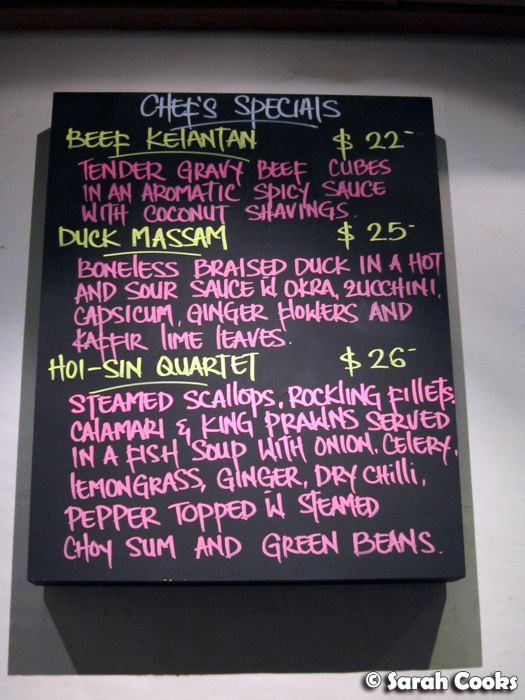 Duck Massam - Boneless braised duck in a hot and sour sauce with okra, zucchini, capsicum, ginger flowers and kaffir lime leaves. $25. Finally, we have my favourite dish of the night: the Duck Massam. It contained a generous amount of boneless duck pieces, and I absolutely loved the sauce. 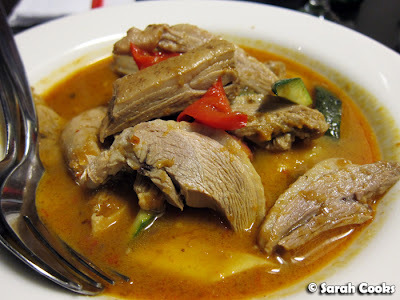 It had a nice chilli heat to it, and an addictive sour taste: similar to assam laksa or fish head curry. Lovely! 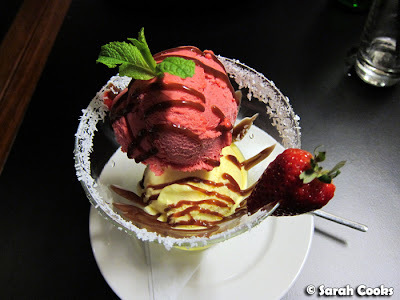 Refreshing, fruity sorbets are always nice after a rich and spicy meal! I love traditional Malaysian desserts, and this comforting sago pudding topped with rich coconut milk (mmm... santan... lemak!) reminded me of the bubor cha cha and pulut hitam that my mum used to make when I was a kid. 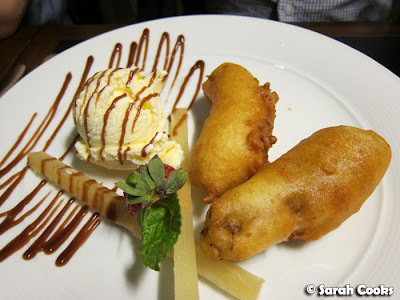 And of course, we had to order the classic Asian-restaurant dessert: banana fritters. Who doesn't love them? They just go to prove my theory that "deep fried" makes everything better, hehe. I was impressed by the generous size of the bananas (har har), but wasn't convinced about the need for the drizzle of chocolate sauce. However, overall it was a satisfying dessert: freshly fried, crispy and tasty. It was a super fun evening - fantastic company and lots of delicious food. It was also good to try some new dishes, as I tend to stick to my old favourites whenever I visit. Thanks to Clement and the team at Monk for a great night! Sarah and friends dined as guests of Monk and Me.